It’s been a busy summer for me. I officially resigned from the Bethel School District, moved myself from Tacoma to Seattle, started a new job as the Distance Learning Coordinator for the Northwest Regional Primary Care Association, began working as a freelance web designer, picked up the pace on the challenge course as I increase my responsibilities and commitment, all while still getting out on plenty of backcountry excursions. Today, I thought I’d share some of those adventures with you. This was an excellent short overnight with Amy and some friends. We made our way up the West Fork Trail (following the west fork of the Foss River) towards Trout and Copper Lakes. 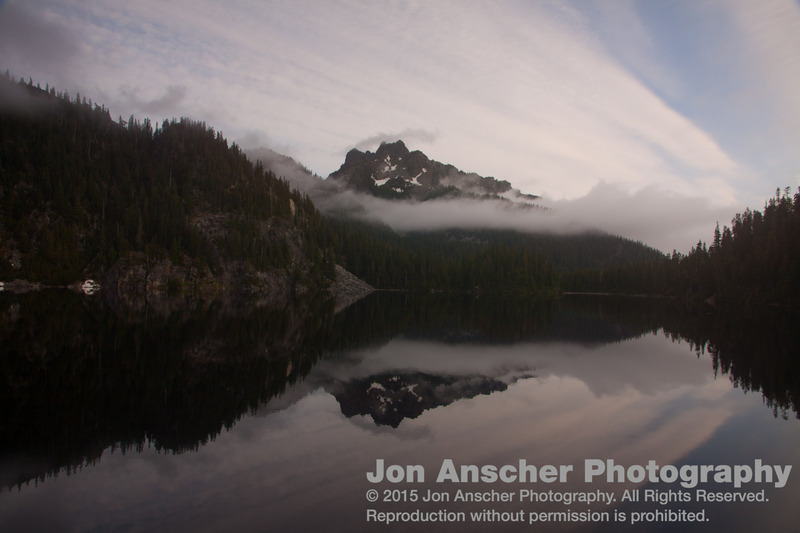 I took a quick excursion towards Little Heart Lake the next morning as well as a small jaunt back down to Copper where I got some of the amazing reflection photos. 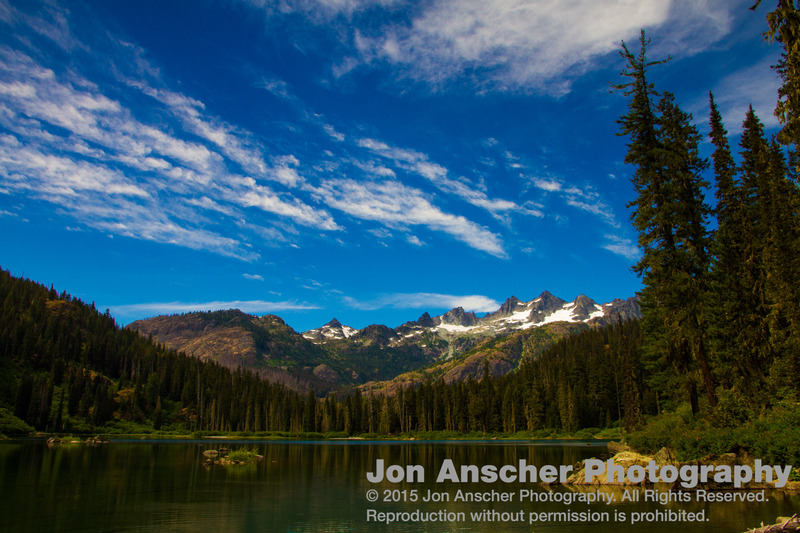 I’d have loved to adventure up to Lake Malachite as well as journeyed on to Big Heart Lake, but we were in and out quickly on this trip. This beautiful trail on the north side of Rainier is like a little mini Wonderland Trail. I had attempted this loop twice before and both times had to leave early due to an injury. This time, I had been through Moraine Park, Mystic Lake, Skyscraper Pass, and Berkeley Park many times before, but this was my first jaunt towards the Northern side of this loop. Grand Park was an awe-inspiring sub-alpine meadow, reminiscent of scenes from the Sound of Music. And Windy Gap was a breathtaking Alpine journey through rocky streams, mountain heather, and a snowy pass. A side jaunt to the natural bridge seemed much farther than the advertised .7 miles, but was well worth the journey. And to end that long day, we camped at the mystical Yellowstone Cliffs. Though the cliffs stayed hiding in the clouds when we first arrived, they gave us a small peak at the granite walls that night and were fully exposed in the early morning when I woke. That is perhaps the most beautiful camp I have stayed at yet in Mount Rainier. This is a trail I have frequented over the years, and it has yet to get old. The feature image at the top of this post is a sunset beating down on Mount Rainier from a rider above Spray Park. I have been regularly awe-struck by the alpine glory of these meadows. On this little trip, I packed a heavy load into Eagle’s Roost which I used as base camp for a quick sub 24-hour overnight. I arrived at camp at 5:00 and was setup and quickly packed my stove, dinner, and camera gear into a day back by 6:00 when I departed for a Sunset hike up to Spray Park. Finding a small ridge, I sat and alternatively watched the sun set over the valley below and light up the mountain behind me. These are perhaps some of my best pictures of Rainier yet. 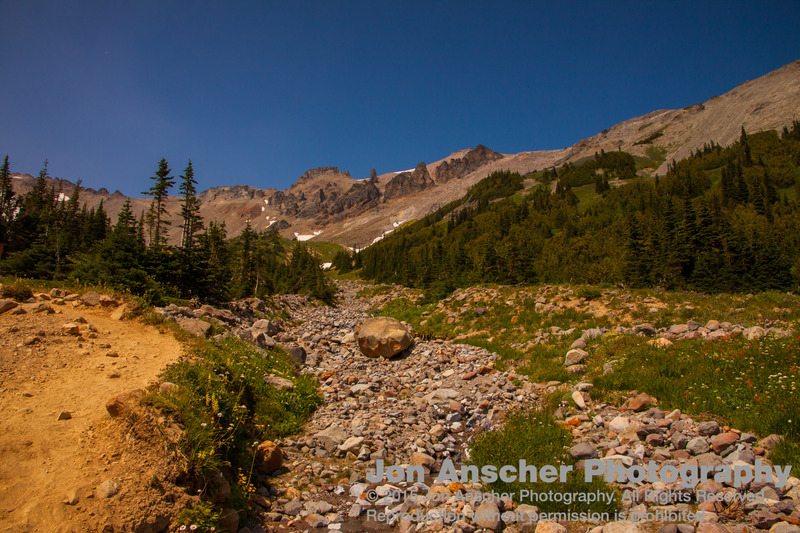 The next day, I journeyed up to Spray Park again, this time taking a side detour towards Knapsack Pass. I was, unfortunately, prevented from going all the way due to a precariously placed snowfield. After reports of clear trails and my scouting the night before, I’ve left my ice axe behind. But, it was for the best, as it gave me an opportunity to still truck myself up towards Seattle Park and the high point of the hike towards Cataract Valley. Though tempted by the idea of slipping a little ways down into the valley, time and energy were waning, and I instead turned around for the journey home. Harold and I took a quick day hike up to this amazing basin. Despite the short distance of this hike and the raving reviews I’d heard from others, this was my first visit to Glacier Basin. I had no idea what I had been missing. 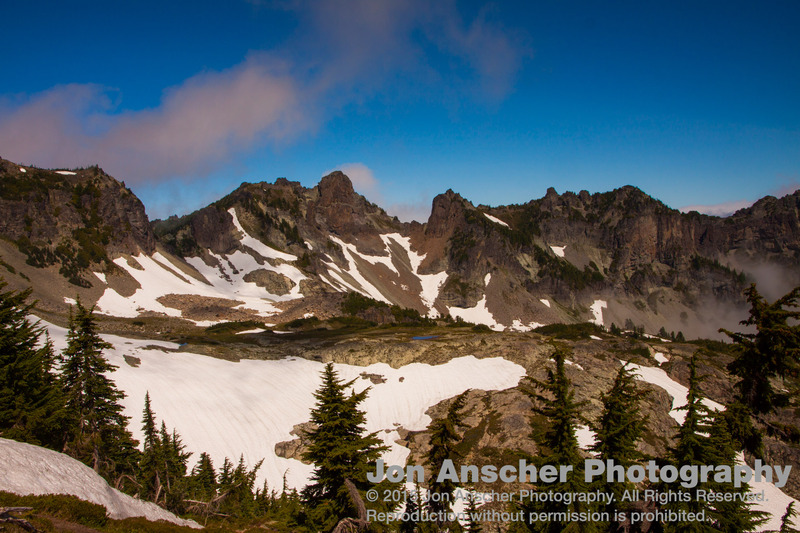 The trail itself was very well maintained and we had no trouble quickly getting into this epic Rainier basin. Once there, the basin houses a plethora of campsites and a 270 degree view of pure alpine basin. We apparently had just missed a bear bath in the pristine alpine tarn. Bears frequent this area and have grown quite aggressive over the years. We hiked a ways up into the basin, seeing paths in many directions. This would be a wonderful place to camp and explore, and a likely spot for bear sightings. This was the culmination of our summer adventures: six days through some of the most remote land in Washington. The feature image at the top of this blog was from the base of Mount Daniel, near Peggy’s Pond—around the halfway point of our hike. Over the course of the week, Harold and I swam in pristine mountain lakes, climbed steep mountain passes, scrambled over tricky unmaintained trails, and walked through the silent and lonely Escondido Tarns. This trip I took with my friend and mentor, Loren, and his son, Noah. We traveled a short distance out from Sunrise Point along this pristine alpine and sub-apline ridge to Upper Palisade Lake. Despite hearing elk call all night long, we saw not a single elk on our entire trip. But we did end with a distant goat sighting of two little herds on the distant mountain range. The next leg of my hiking journey takes place in my once home, Colorado. This hike, along with the next two, was taken with my good friends Jean and Jerry. 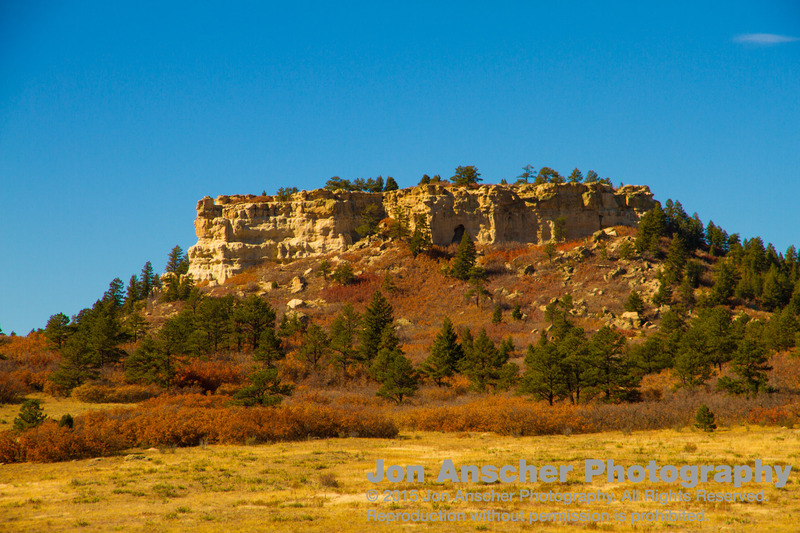 Spruce is located near Castle Rock and is a perfect, short hike around Spruce Mountain. We were lucky enough to tromp right into a pair of deer along this trail. This next hike was in Rocky Mountain National Park. Along the way are a plethora of little water falls that give nice breaks in the trail. 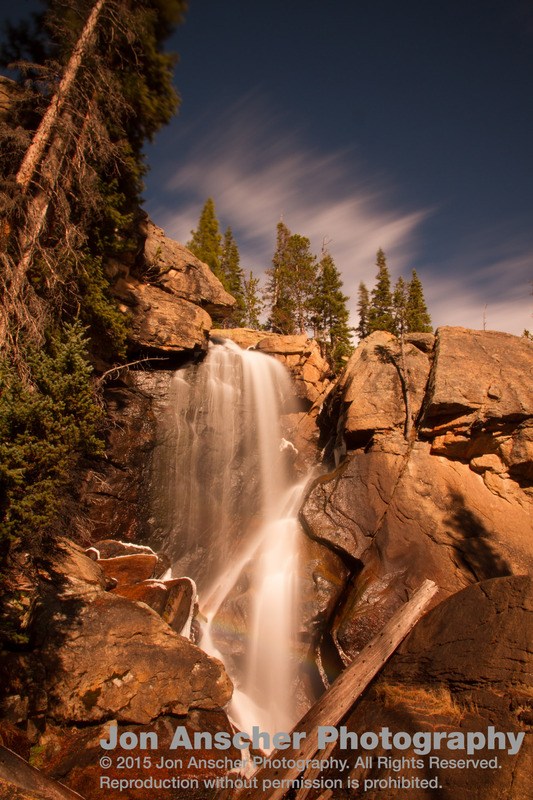 The hike continues on to Lake Ouzel and beyond, but we stopped at the beautiful Ouzel falls where I got the “money shot” of my trip to Colorado. Following our trip up to Ouzel Falls, we continued our picture taking experience with a roadside tour of Rock Mountain and the surrounding neighborhoods. We were rewards with many elk, deer, and even a distant wolf. Wow, gorgeous photos! You’ve managed to take full advantage of the beautiful summer while still getting new ventures going–good for you! Thanks! I do try and take full advantage of the summer time when I can :-).